State and local authorities in Richmond have released new details about last December's shooting at Dennis Intermediate School. 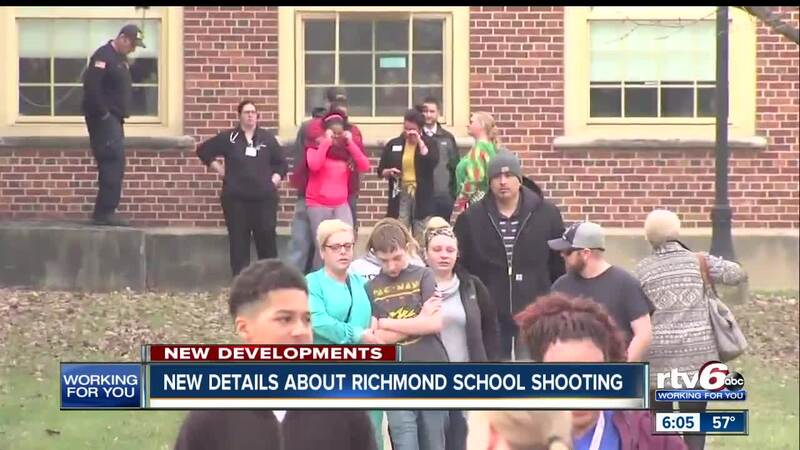 RICHMOND—Police and school officials are releasing new details surrounding the Richmond school shooting last December and singling out the actions of the school principal during the incident. On that day, a 14-year-old boy shot out a locked door at Dennis Intermediate School and exchanged gunfire with police inside the building before shooting himself. At a Richmond news conference Tuesday, Captain Dave Bursten, Chief Public Information Officer for the Indiana State Police, detailed what happened starting at 8:15 a.m. that day. 911 dispatchers received a call from the boy's mother saying her son had taken her boyfriend hostage and had made a specific threat against the school. Within minutes, police arrive at Dennis Intermediate and see the suspect who has been driven to the school by the boyfriend. The 14-year-old shoots out a locked door and goes inside the building. He's armed with a pistol and a Remington 700 bolt action rifle with scope. In the car are two plastic water bottles filled with gasoline that the boy planned to make Molotov cocktails with, according to police. Inside the school, the suspect exchanges gunfire with police. At one point, he's in a stairwell and Principal Nichole Vandervort is able to see his location on security monitors and relays that information to police. Bursten said that without Vandervort's information, officers could have been wounded or killed. The boy eventually took his own life with a single shot. No students, staff or police were hurt during the incident and Bursten said the suspect was not hit by police gunfire. The investigation showed the boy did not have a specific target at the school, but was out to cause maximum damage and harm. As for the guns, police confirmed what RTV 6 first reported in December, that the suspect had broken into a locked gun cabinet at home to get them. Bursten said police are finished with their investigation and have turned over a report to the Wayne County Prosecutor.